The scope of Yoga is not restricted to Asanas or physical exercise only. The ambit of yoga goes much beyond and in the Vedic texts it has been described as Brahma Vidya or Prana Vidya. This has been well established by Dr.Swami Divyanand Saraswati in his book "Vedon may Yog Vidya", pub.by Yogic shodh Sansthan, Yog Dham, Arya Nagar, Jwalapur, Haridwar, Ist Ed.pub.in 1983 For the information of members, I would like to add that Swami Divyanand got his Ph.D on the above topic from Gurukul Kangri University, Haridwar and also his D.Litt. on a related theme from Hemwati Nandan Bahuguna Garhwal University. It is observed that many a times some practitioners of Yoga assume externals of Yoga as its final objective while ignoring its inner core. Regarding the true objective of yoga, Sri Aurobindo clearly says "To restore harmony which has got out of tune, a change is required. This Change is not possible except by Yoga." At another place, he says "For this purpose the practices of Hatha and Raja Yoga are not sufficient and even Trimarga will not serve; we must go higher and resort to the Adhyatmayoga. "Source: The Yoga and its Objects by Sri Aurobindo, pub.by Sri Aurobindo Ashram, Puducherry. In nutshell for Sri Aurobindo "Yoga is the founding of life and consciousness in the Divine". indrasya nrimnam stha...... jishnavey yogaya brahmyogervo yunjim.... .
...vishvani ma bhutaniup tishthantu yukta ma aap stha (Atharvaveda 10.5.1-6)"
In the first mantra, there is a reference to descent and ascent of consciousness to dig out the Veda from the inmost sheath of human consciousness and to restore it to the same. This is actually the yoga process by which one can gain what the mantra calls the Brahma-virya to do the desired deed. In the second mantra, the poet talks of uniting the unmanifested and the manifested levels of human personality by filling the gap between the two. Then, he says how by digging out the Veda with the help of both the levels, the actions have to be performed. "(Source: Paper on Vedic Basis of Indus Culture by Late Dr.Fatah Singh, presented in JNU Study Centre, New Delhi in 1993). Swami Dayananda Saraswati in his book Rigvedaadi- Bhashya- Bhumika has recommended Patanjali's Ashtanga Yoga including pranayam, dhyan, dharana and samadhi. He says "When posture has been fully brought under control, one is able to regulate the breath." In his book Satyartha Prakash, (pub.in 1875), Swami Dayanand also recommends regular practice of Pranayam (on the authority of Manusmriti) for every student. Here Maharishi Manu enumerates the benefits of Pranayam and says that Pranayam helps in burning away all the impurities of the body and mind like a furnace fire burns up all the impurities of the raw gold and other ores. 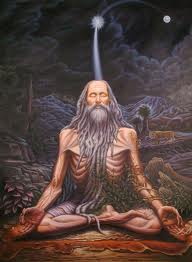 Maharishi Manu opines that for a Sanyasi, Yoga is most significant. He says "By means of Yoga, this life of inner self-direction, a sanyasi will be able to yoke his smaller to the larger Self and enter into the world of the One, with whom he owns complete kinship. He should be compassionate, truthful, forgiving maintain strict continence, abstrain from greed, be clean, contented, self-controlled and studious(Manusmriti VI.91-93). He should sit in an easy posture, withdraw from all sense stimuli(Manusmriti VI.49). He should practise pranayama, the prolongation of his breath in the three fold manner prescribed by the teachers of the subject and thereby energise his apparatus of vitality, pranamaya kosha. The meditation should be accompanied by the intonation of the Sacred Word, Aum, which is his calling himself back to the reality of his inner Being, one with the Eternal, the Divine." Source: Manu Dharma Sastra by Kewal Motwani, Pub by Ganesh & Co.(Madras) Pvt.Ltd., 1958 Ed. According to Gherandsahmita the larger objective of Pranayam is to obtain infinite bliss and realization of manonmni shakti through ascent of consciousness. Pranayam is an essential part of daily prayer Vedic Sandhya to be performed twice a day. Dr.Deen B Chandora, in his book Vedic Satsang(a publication of Greater Atlanta Vedic Temple Society,Inc., USA), states that the word 'Sandhya' is made up of two words Sam+dhye. 'Sam' means completely immersed, 'dhye' means meditation. During recitation of Sandhya mantras, pranayam is also performed to attain the meditative stage. According to Dr.Chandora Sandhya/meditation has added benefit of relaxation to one to lead a serene and tranquil life. "(Also pl.refer to Sandhya-Yog aur Brahma Saakshaatkaar by Brahmchaari Jagannath Pathik, pub.by Vijaykumar Govindram Hasanand, Nai Sarak, Delhi, Ed.1996). In his book "Lectures on Yoga Meditations - As revealed in the Holy Vedas" pub.by Deva Vedic Prakashan, Pali Hills, Bandra, Mumbai(Ed.1983), the author - Mr.Devendra Kapoor has culled some mantras from all the four Vedas to explain the divine wisdom of Yoga meditation for the wonderful union of the human soul with the supreme being, e.g., he quotes Yajur Veda Mantra 31.18 which says Vedaham etam purusam manhantam adityavarnam tamasah parastat "I have crossed all the dark valleys of death. The veil of ignorance has been removed. I am face to face with my beloved Lord. I am visualising the bright divine light of the Grand Purusa, which sparkles like the brilliant lusture of the Sun." Likewise there are many Ved mantras which talk of contemplation and spiritual growth and not just material advancement. Excerpts from the book 'Yog in Synergy with Medical Science' by Acharya Balkrishna, published by Divya Prakashan, Patanjali Yogpeeth, Haridwar, Aug.2007 Ed.Forward by Swami Ramdevji. "Undoubtedly the blessing of Yog is supreme among the gifts of Vedic sages. It is a knowledge, which is free of disputes and controversies, it is an art which is multidimensional, and it is a science, which assures abundant happiness even when there is a paucity of resources. Yagavalkya has made a humble appeal in 'Yagyavalkya Smriti' and said, Ayam tu paramodharmo yadyogenaatmaadarsanam. It means self realization with the help of Yog is the supreme duty. It gives us insight into how Vedic society was so much taken up to Yog." "We cannot deny the fact that before sage Patanjali, this glorious tradition of Yog was not organised in a scientific and systematic manner in great detail." "Many Vedic Samhitas discuss directly or refer to various aspects of Yog. Although in these places the discussions on mind control, prana (vital energy), and sadhana (regular practice) are not detailed and systematic, they do catch our attention. Rigveda mantras (1.18.7,1.34/9, 10.13.1) mention yog. Some mantras included in Yajurveda describe the concentration of mind and the results obtained thereby. Mantras 1-5 contained in chapter 11th of Yajurveda talk about Yog in detail and probably no other Samhita could present it so wonderfully"
(Almost all the authors have explained the word saptarishaya as seven Prans or vital life energies)"
"Ahirbudhnya Samhita mentions Hairanyagarbha as the originator of Yog. It classifies Yog into two types-external and internal or physical and disciplinary which includes the Yama-Niyam. In Yagyavalkya Smriti(125) and Mahabharat (12.349.65) also Hiranyagarbha is stated as the originator. "Hiranyagarbha yogasya vakta nanyah puratanah,"Hiranyagarbha was first to speak of Yog. In another context, in Mahabharata(12.342.96), Hiranyagarbha has been described as omnipresent and powerful. The 121st verse of 10th chapter of Rigveda is known as Hiranyagarbha verse. The Hirangarbha as mentioned in Mahabharata is none other than the Brahm of Hiranyagarbha sukta. Ramayana declares Him as the soul of the entire universe (Adhbut Ramayana 5.6)." (Source: 'Yog in Synergy with Medical Science' by Acharya Balkrishna, published by Divya Prakashan, Patanjali Yogpeeth, Haridwar, Aug.2007 Ed.Forward by Swami Ramdevji). Thus, it would be the height of ignorance and mental darkness, if someone questions the Vedic origin of Yoga and maliciously shows its source elsewhere.